1. Where is young bunny Judy Hopps when she's telling the story of predator and prey evolving, living together in peace in Zootopia, as well as her desire to be a police officer? 2. What do Judy's parents - and her 275 brothers and sisters - are involved in this line of work. 3. Young Judy stands up to a bully - fox Gideon Gray - after Gideon does this. 4. Shortly after graduating from the academy, Judy's off to Zootopia. What does she take from her parents to appease them before getting on the train to Zootopia? 5. Judy meets Benjamin Clawhauser, a cheetah who works dispatch at the precinct. Benjamin is aghast when he realizes he's stereotyped Judy. What did he say to Judy that caused her to speak up? he suggested she "hop along now"
bunnies can call other bunnies "cute", according to Judy, but when other animals do it, it's frowned upon. 6. Judy's disappointed when her boss, Chief Bogo, assigns her to ______ rather than to the high-profile missing mammals case. 7. Judy assists fox Nick Wilde after Nick is refused service in an establishment. What is Nick trying to buy for his "son"? 8. Day 2 on the job looks a little more hopeful for Judy when this happens in front of her. 10. Chief Bogo tries to fire Judy after Judy offers to find a missing otter in front of the otter's wife. Fortunately for Judy, someone interferes at the right moment, which temporarily saves her job - who was it? 11. The search for Emmitt Otterton brings Judy and Nick to an establishment that makes Judy more than a little uncomfortable - why? 12. Judy and Nick discover that Emmitt Otterton was last seen in a limousine belonging to a crime boss with this nickname. 13. Judy and Nick's lives are spared after it's discovered that _______. 14. According to the jaguar who saw him last, Emmitt Otterton was talking about this before he became savage and attacked the jaguar. 15. Nick tells Judy of an incident when he was a young fox, where his fellow Junior Rangers _______ because he was the only predator in the troop. 16. What does Nick think to use in order to get information about the jaguar's transformation to predator? 17. How do Judy and Nick get past the timberwolves who are guarding Cliffside asylum? 19. What does Judy give to Nick before she goes up to speak at the press conference? 20. Judy is sad to see this happening shortly after her panic-inducing press conference. 21. 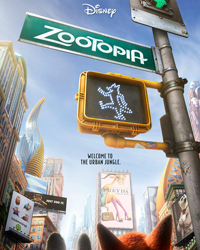 How does Judy react when she's asked to be the "face of Zootopia"? 22. Back in her hometown, Judy runs into former bully Gideon Gray, who is now partners with her parents. What does Gideon do for a living? 23. Judy discovers during a conversation with Gideon that "night howlers" aren't wolves. What are they? 25. Nick and Judy discover that the new mayor Bellwether is behind the evil plot. Bellwether shoots Nick with a pellet, assuming he will turn savage and kill Judy. She is unaware that Nick and Judy swapped the pellet with this item.